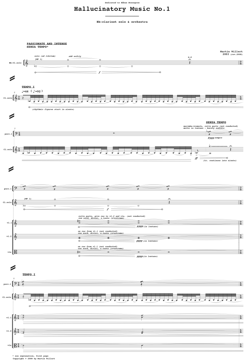 HALLUCINATION is the original concerto from 2003 (although revised in 2008). The concerto is dedicated to Håkan Rosengren and was commissioned by The Swedish Concert Institute (Svenska Rikskonserter). Hallucinatory Music No.1 is a short version of the concerto, focusing on the first theme. It contains the essence of the concerto. 6-7 minutes long. Hallucinatory Music No.2 is an excerpt from the middle part of the concerto (second theme). Hallucination Solo is basically the same short version as Hallucinatory Music No.1, but as a solo piece. Please make sure you have the final version (© 2008 in all versions). The older versions from 2003 ("version A" & "version B") are withdrawn! In the beginning of the piece - a lonely clarinet evolving so modestly that the notes rather underline the silence, salutes it, the strings join in like a gentle touch, gliding and atonal but in such a peaceful manner that the nervous wave calms down immediately. This is contrasted by stressful sections. In conclusion a very exciting piece of music. A kind of sweet melancholy performed by a well sounding orchestra and a very sensitive clarinet - which the piece demands – played by Håkan Rosengren.